BERLIN, Feb. 22, 2018 — (PRNewswire) — Winners of the 2nd Asian Brilliant Stars were announced on February 21st in Berlin. YOUTH, the latest film of Chinese director Feng Xiaogang, is the biggest winner of the Award Ceremony. Screened in the Special Presentations at the 2017 Toronto International Film Festival, Feng Xiaogang's YOUTH topped the December box office in China with over $157 million (1 billion yuan), ahead of Pixar animation COCO. "Feng employs traditional craftsmanship to draw a sweeping historical canvas with profound human upheavals that mirror virtues and flaws of the Chinese people" (Variety). 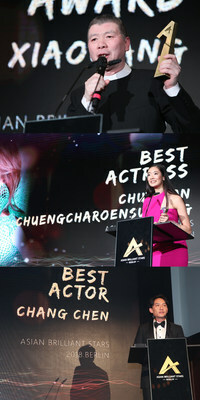 YOUTH has received three of the 2nd Asian Brilliant Stars Awards: Special Jury Award to Feng Xiaogang, Best Screenwriter Award to Yan Geling, and Asian New Talent Award to Zhong Chuxi, leading actress of the film.